Holiday Inn Express in Concepción is found right in front of the biggest shopping mall of the city, putting the hotel in the center of the financial, tourism and commercial center of Concepcion. It is only three minutes away from the airport; you can walk by the city in a matter of minutes and reach the important university buildings in only ten minutes by car. 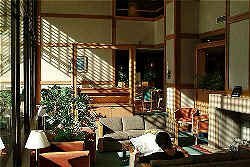 It is a five stars hotel with offices all along the country, and in Concepcion it welcomes Chilean and foreign tourists with 120 rooms prepared for those who travel for business and for pleasure. 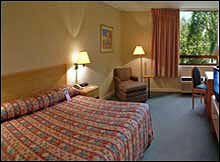 All rooms have private bathroom, a comfortable king size bed, work desk, air conditioned, coffee maker, room service around the clock, satellite television, additional bed if asked and ironing board. There are rooms available for the disabled and for those who prefer a non-smoking environment. The hotel offers WI-FI in all rooms and common areas, making it easier for you to keep in touch with the world and your home. At the same time, there is a business center with computers, printer, photocopier, fax and telephone for national and international calls although only the local ones are free of charge. If what you want is relaxing and clear your mind, you can spend the day at the gym and loose all stress, or go outdoors to the swimming pool, the Jacuzzi or the sauna. The use of all these services is free of charge as well. Number of Rooms: 120 rooms. Rates Includes: Buffet breakfast, use of Gym and Jacuzzi.